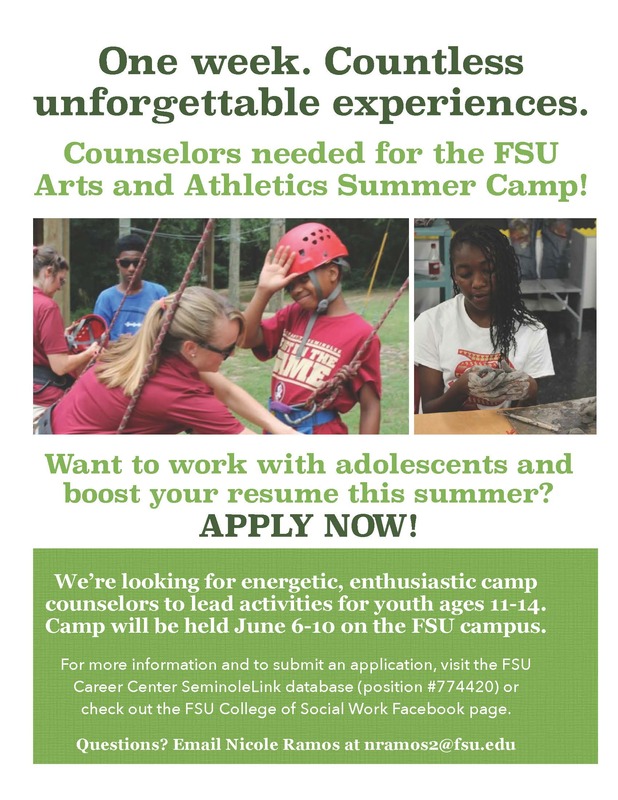 The Arts and Athletics Summer Camp Program is looking for enthusiastic students who have an interest in positive youth development to serve as summer camp counselors. The camp provides students aged 11-14 a foray into university life and academics, with a focus on the arts, athletics, and student life. The camp will be held from June 6 – June 10. 2016. Camp counselors will lead campers through the activities of the week and will be responsible for camper safety, engagement, and behavior. The counselor will hold in high regard the ideals of teamwork, respect, responsibility, and collaboration. Counselors will be available from 8 a.m. to 5 p.m. each day of the camp. The camp counselor positions are all volunteer positions. All majors and disciplines are encouraged to apply. For more information and to submit an application, visit the FSU Career Center SeminoleLink database (position #774420) or check out the FSU College of Social Work Facebook page.